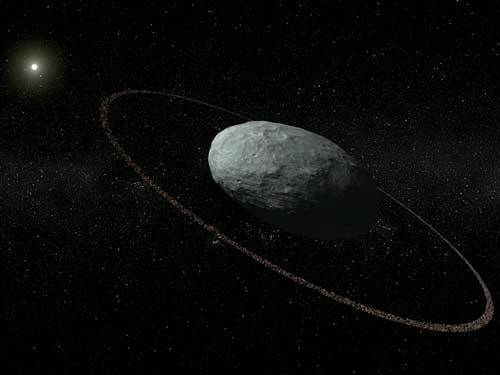 (Nanowerk News) Haumea has a narrow and dense ring orbiting the dwarf planet according to the recent observations of a stellar occultation by this dwarf planet. Ten observatories in six European countries were involved in the research campaign. 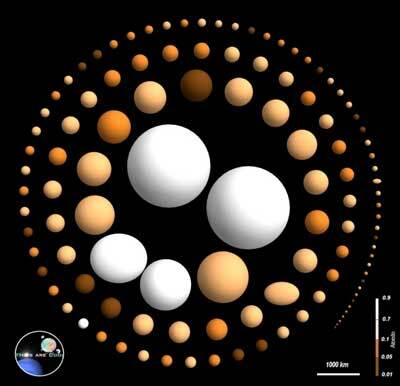 In addition, the astronomers at the Max Planck Institute for Extraterrestrial Physics and more than 50 further institutions were able to constrain the size, shape and density of Haumea. Their findings (Nature, "The size, shape, density and ring of the dwarf planet Haumea from a stellar occultation") are closer to theoretical predictions and less puzzling than previous estimates. Already in 2015, the possible occultation of a sufficiently bright star was identified and in September 2016 Gaia catalogue was released, whose improved positions for more than one billion stars made predictions of stellar occultations by asteroids much easier. However, the calculation of events caused by TNOs remains difficult. These objects have been discovered fairly recently and astrometric observations are available for only a small part of their orbits. Therefore, a large astrometric observing campaign was needed close in time of a potential occultation event to be able to calculate the shadow path and alert the network of observers in January 2017: a total of ten observatories in six European countries obtained data on the occultation. Recent occultation campaigns already revealed rings around several minor planets in the trans-Neptune region, such as Chariklo and Chiron, and unexplained lightcurve signatures might indicate that also other objects might have a ring or ring systems. The reflectivity of Haumea’s ring is similar to those found so far. The position angle of the ring coincides with that Haumea’s minor axis, suggesting that the ring lies in Haumea’s equatorial plane. Previous observations have already shown that the satellite Hi’iaka is in orbit there. The ring, however, is close enough to Haumea that accretion cannot proceed to form another satellite.